For many years, Mel Gibson has been at the center of controversies and other unwelcome attention-grabbing incidents. While this normally kills any actor’s chances of reviving their careers, Gibson has instead managed to remain somewhat unscathed by retreating into his other skill: directing. As we’ve seen from some of his other directorial efforts, he is skilled behind the lens, even if many themes remain the same. From Braveheart (1995) to The Passion of the Christ (2004), Gibson has a tendency to be pretty brutal in the imagery he brings to the screen. Granted, this is partly due to the semi-factual source material. In his latest work after a long hiatus, Gibson brings us the brutality that is World War II. Hacksaw Ridge takes some time to get to its emotional center, but the unfortunate side effect of this is a series of characters that feel almost comical in their exaggerations. From Andrew Garfield’s goofily grinning Desmond T. Doss to Hugo Weaving’s alcoholic Tom Doss, the reality of war easily sets in once Desmond is allowed to deploy to the Pacific theatre and “fight” with his fellow man, attempting to do what no one else is willing to: save more lives than he ends. 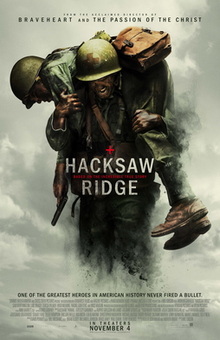 The brutality of Hacksaw Ridge is clearly portrayed by Gibson’s directing, most of the time being a bit over the top. Partly because everything in this film seemed overly exaggerated, it’s almost hard to take it very seriously. Sure, the religious themes intertwined with the duty of going to war were an interesting combination and the real-life story of this human savior was inspiring; but at the end of the day, the other aspects of the film seemed to lessen these impacts. A brutal look at the true cost of being a conscientious objector during war, I give Hacksaw Ridge 3.5 stars out of 5.